What: The annual tradition offers a chance for parents to show off Ocean City’s newest generation. 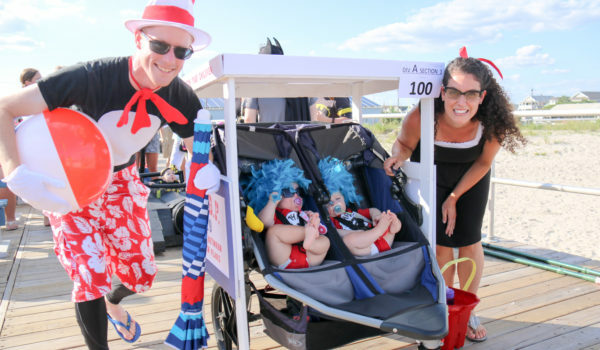 The parade features children cruising the Ocean City Boardwalk in themed strollers, wagons and floats. When: The 2018 parade will start at 10:30 a.m. on Thursday, August 9, 2018. Where: It starts at Sixth Street with children finishing at 12th Street and all other entries continuing to 14th Street. Who: The parade is open to all children ages 10 and under with their families. The Give and Take Jugglers will participate and perform a show after the parade in front of the Ocean City Music Pier. The Crescent Shrine Clown Unit, Miss New Jersey Jaime Gialloreto, 8-year-old Netflix series “Maniac” star Aaralyn Anderson, the Ed Coles Band, the OCTC Spotlight Performers Show Choir and Queen Infanta 2018 Grace Bromhead also will be part of this year’s parade.